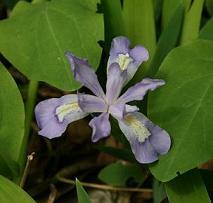 If you’ve been waiting to come out to the preserve to see orchids or azaleas, now is the time! Currently, Pink lady’s slipper is in bloom. There are several flowers easily accessed by the study pond, and the first portion of the Cassa Burro trail. There are full blooms now and others that will be coming along a little later. The Showy orchis may be on its way out, but still to come are Puttyroot, and Twayblade. There are three different azaleas flowering now, including Mountain azalea and Pinxter. If you haven’t seen our native Flame azalea before, you’re missing out! This species is endangered in Ohio, and is one of the most beautiful flowers you’ll ever see. It should begin to bloom this week. Tomorrow and next weekend are the last of the spring wildflower hikes. There is alot to see, and we have lots of “fun facts” to enlighten you with. Also tomorrow is our International Migratory Bird Weekend bird hike. I think the official name is Wahkeena Warblers and Wildflowers, or something like that! We’ll be meeting in the parking lot and the cost is only $3 per person, and as usual OHS members are free! I’ll post a list of new birds we see, tomorrow. This year should be nice; last year it poured down rain almost the whole time. ← April showers brought LOTS of flowers!